It’s hard letting go of things we love — your favorite t-shirt from college that doesn’t fit anymore, that souvenir from a trip you took 15 years, your fridge that’s given you an endless amount of comfort in the form of food. But every fridge has a lifespan and if you’re keeping yours longer than you should, you could be costing yourself a lot of wasted money. If you recognize these signs that you need a new fridge, make some changes in your kitchen appliances. A fridge that always needs fixing is not functioning the way it should. With all the amount of money you’re spending on repairs, you could just as easily buy a new fridge. If there’s nothing wrong with your seal, too much condensation on the inside of your unit is a tell-tale sign that you need a new fridge, since condensation means your fridge isn’t keeping a consistent temperature — that leads to spoiled food. There’s frost build-up in your freezer. Some frost buildup can be easily fixed through a defrost process, but if this is always happening, your unit isn’t running efficiently and is costing you money. You’re better off buying a new, frost-free model to cut energy costs and save you from having to manually defrost it. Are you unsure if you need a new fridge? Ask the experts at Speedy Refrigerator Service. We’ll be able to diagnose your fridge’s problem and help you decide what your best next move is. For more information or to schedule a service, call us 866-782-9376. An extra freezer in your home can offer you a wealth of convenience. It lets you buy more food in bulk and actually have a place to store it without overstuffing your fridge and freezer in your kitchen. But a separate freezer is also a big investment that requires you to consider a few details. When it comes to freezer shopping, here’s what you should keep it mind. 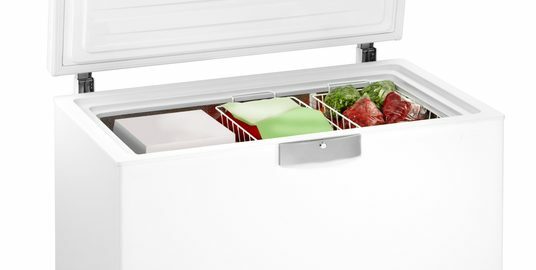 The amount of space you have available for your freezer will determine the type of model you can get. If you only have an a small amount of space, you may be limited to an upright model. These also usually offer more organization options. If you have a bit more space to spare, you could get a chest unit that holds more food. If you have more people to feed, you’ll end up keeping more food in your freezer. And since a fuller freezer stays colder than a freezer that’s only have full, your unit will function better. What Kind of Defrost System Do You Want? Different models have different defrost systems — some are frost-free, while others need to be defrosted manually. While frost-free units may be more convenient, manual-defrost units may be cheaper. Before you go freezing shopping, make sure the freezer you already have is in good shape. The experts at Speedy Refrigerator Service can handle any freezer repairs you need — no job is too big or small. For more information or to schedule a service, call us at 866-782-9376. What’s the Problem with Your Refrigerator Compressor? When it comes to diagnosing problems with your fridge, some issues are easier to solve than others. For instance, if your fridge light doesn’t work, it’s pretty safe to assume that you simply need the light bulb changed. But problems with your refrigeration compressor are a bit harder to solve. That’s why we’re here to help. Your compressor fan is responsible for helping keep your refrigerator cool and prevent it from overheating. If that stops, your fridge will become a lot warmer than it should and could potentially shut down if the problem isn’t fixed. The compressor clicks on and off. If you’re compressor is constantly clicking on and off, you could have a problem with your start relay or your compressor could be overloading. Since it’s an electrical issue, we don’t recommend trying to fix this yourself. Instead, call a refrigerator repair service — like us! The fridge isn’t cool enough. A warm fridge is one of the biggest and most apparent signs that your have a problem with your refrigerator compressor. The problem could be with the compressor motor, and this needs to be tested to check if it’s malfunctioning. Since most compressors have a capacity, it’s best to call the professionals for this issue. At Speedy Refrigerator Service, we have the expertise and skills needed to diagnose and fix any problems with your fridge or freezer at an affordable price. For more information or to schedule a service, call us at 866-782-9376. There are some noises that won’t surprise you if they’re coming from your kitchen: the coffee pot going to work at 6 A.M., the vent fan running on high as the non-chef in the family tries to cook, and little whispers coming from the kids as they try to sneak late-night snacks. But there are definitely sounds that make you nervous. If your fridge is making noise, your worry level should depend on what you’re hearing. Reason: You fridge may not be level, causing it to vibrate against the area it’s sitting. Fix: Adjust the legs or leveling screws to be in line with the floor. If the fridge is on a platform, make sure the platform itself is level to the ground. Reason: You may hear buzzing coming from your fridge when the water inlet valve opens and closes to feed water into your ice maker. Fix: If your fridge is not connected to a water line, turn off your ice maker. Reason: Your water inlet valve may also click when dispensing water to your ice maker. Reason: Rattling usually happens when the water lines move against your refrigerator cabinet or any items on top of your refrigerator. Fix: Take anything on top of the fridge off, or secure the water lines so they stop rattling. Reason: You compressor fan motor may emit a squealing sounds as air passes over the fan. Fix: If this continues to occur, you’ll need to have your fan motor checked and potentially repaired. At Speedy Refrigerator Service, we have the expertise and skills needed to diagnose and fix any sounds your fridge or freezer is making quickly and at an affordable price. For more information or to schedule a service, call us at 866-782-9376. When it come to anything you own, there are certain actions you can take to keep things in good condition. When it comes to your fridge, Speedy Refrigerator Service comes in very handy in making your fridge run better. No matter what the problem with your fridge is, the longer you leave it alone, the worse it will get. That’s why we offer service within the hour, every day of the week, every day of the year. We help get your fridge in good working order sooner. We Don’t Make You Wait for Parts. At Speedy, we stock 99% of parts in our “warehouse and wheels” so you get the parts you need for a repair right away, not in a week. You’ll experience fewer problems with your refrigerator when you take better care of it. That’s why we offer comprehensive mean in services including condenser checks, coil vacuums, and more, so your fridge stays in tiptop shape. You can even get the service for just $39.95 website and print out our coupon! At Speedy Refrigerator Service, we take the hard work of caring for your refrigerator and always put the customer first. We’ve been serving Long Island, Queens, and NYC for 75 years and always or more information or to schedule service, call us at 866-782-9376.